The Hellspawns are back! and they brought friends! 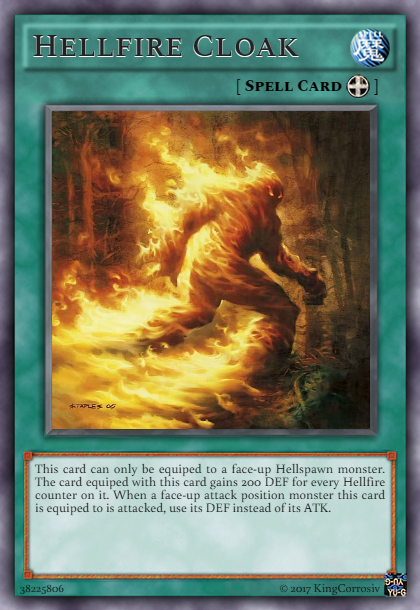 The Hellspawn/Hellfire archetype consists of monsters that work on/with Hellfire counters. These counters keep most of the monsters alive. 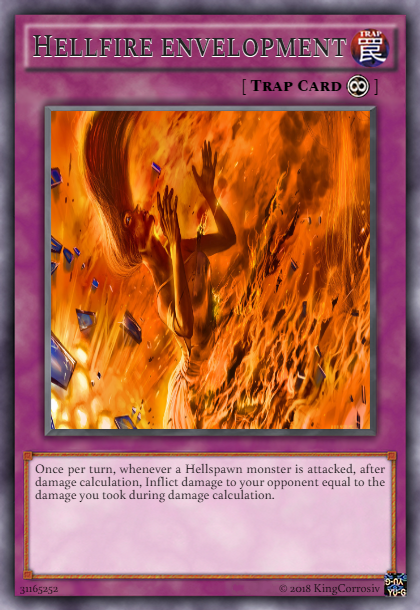 Many Hellspawn monsters are destroyed if they have no counters on them. 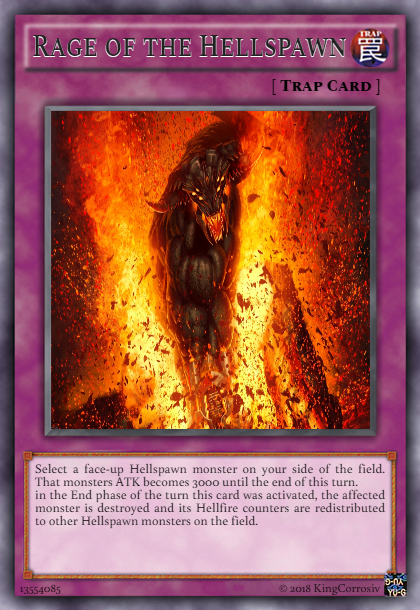 All Hellspawn monsters need counters to activate their effects. the spells and traps use counters to defend or strenghten the Hellspawn monsters, or give/redistribute the counters. Akali is the first and primary tuner of the deck. As long as he has a counter he cannot be destroyed by battle. he also gets a new counter everytime he is attacked. finally Akali can remove a counter to lower or raise a Hellspawn monsters level by one. This tuner has extreme defence for its level. but each turn he gets a counter and per counter he loses 200 DEF. 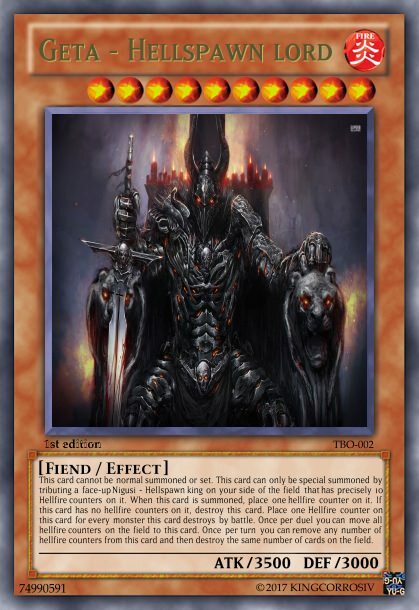 Yemekeri gets one counter for every monster he destroys. he also gets 100 ATK points for every counter he collects. Itoni has three effects. in the standby phase he gets a counter. after attacking. 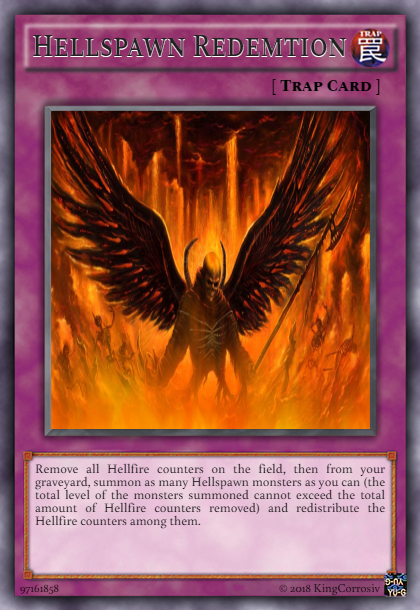 finally you may move counters from him to other Hellspawn monsters on the field. 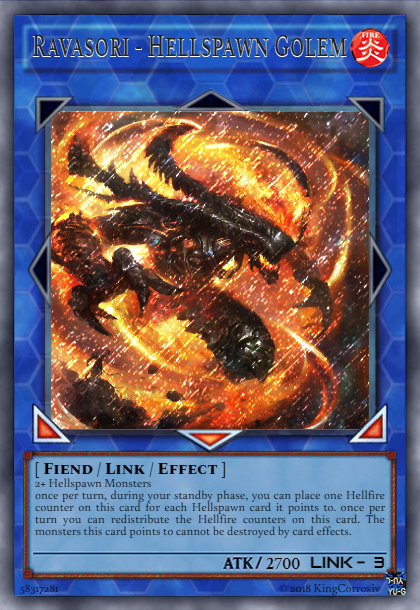 to add a Hellspawn monster from your deck or Graveyard to your hand. Melimayi gets a counter. at any point you can remove all counters and send Melimayi back to the deck. then you may summon a Hellspawn monster whose level equals or is less than the ammount of counters that where on Melimayi. Arami gets one counter a turn. once per turn you can remove a counter to bring a spell or trap to your hand. 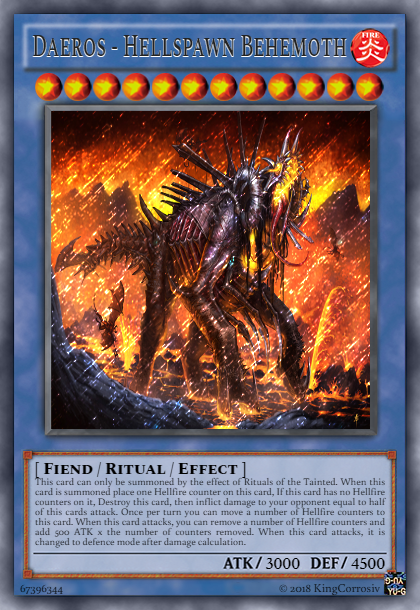 if Arami is destroyed by an effect, he can then destroy one spell/trap for every counter he had at the time of his destruction. If Resa is destroyed when he has a counter on him, he will be special summoned to the field in attack position. 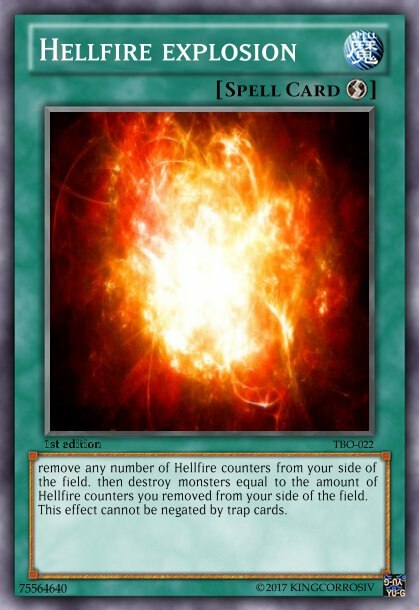 Tila can negate its own destruction by removing a Hellfire counter. If it does it gains 500 ATK. it once per turn, Tila is destroyed. and you can remove those counters to summon a monster from your hand whose level is less than or equals to the counters removed. and as long as there are hellhounds in play, cannot be destroyed. 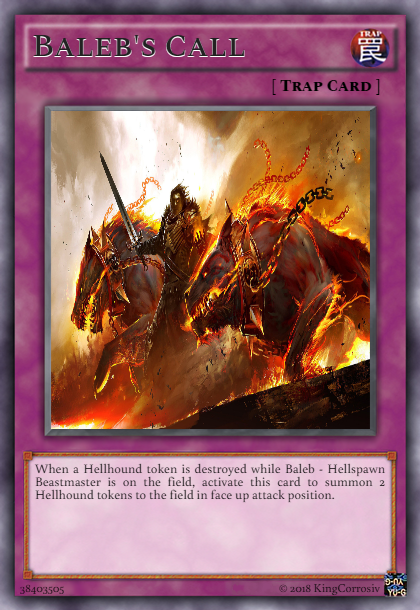 to top it all of, Baleb gets 200 attack for each Hellhound on the field. 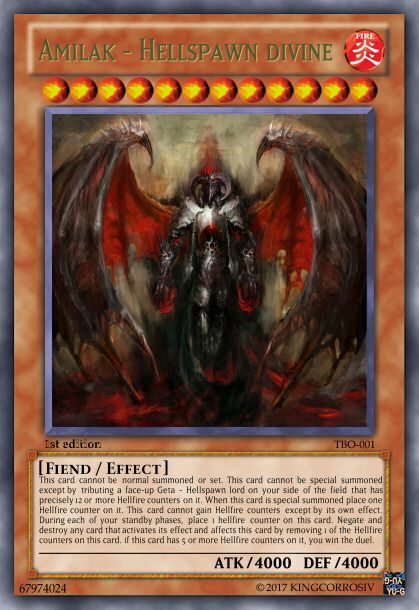 Awire can tribute one Hellspawn in order to destroy one card for every counter on that sacrificed monster. Vishapin gets a counter. 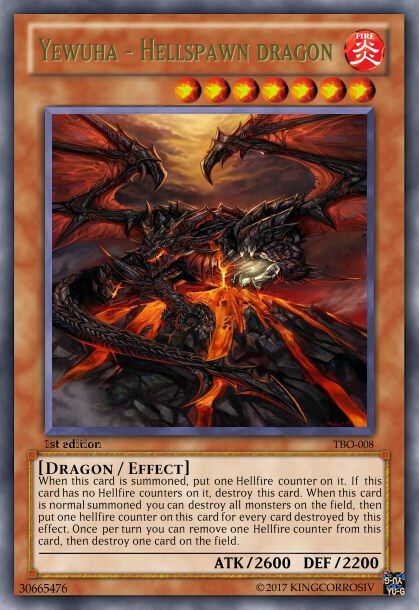 and whenever one of the other dragons would be destroyed, you can remove a counter to negate the destruction. The second Hellspawn dragon. Yewuha can nuke the board and then get one counter per destroyed monster. 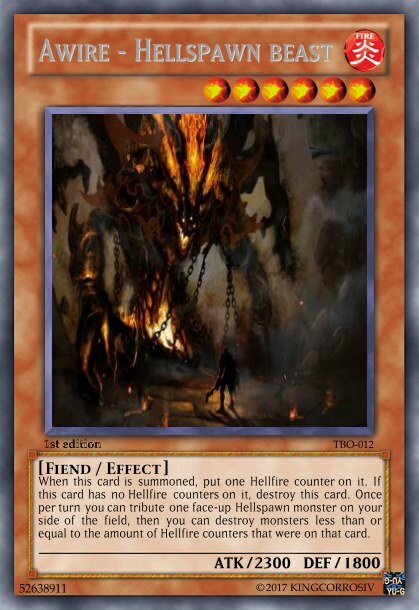 once per turn you can remove a counter to destroy one card. 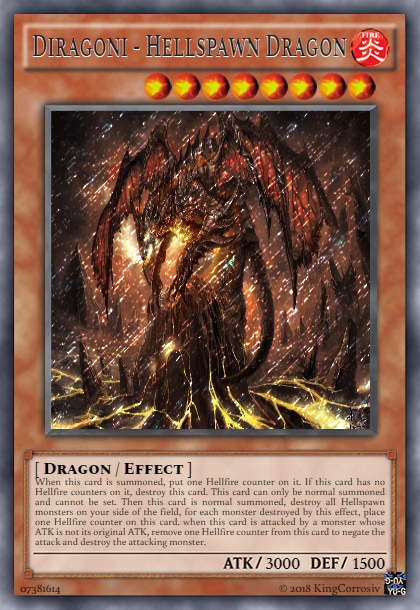 he can also draw in all of the Hellfire counters on your field by destroying the other monsters. 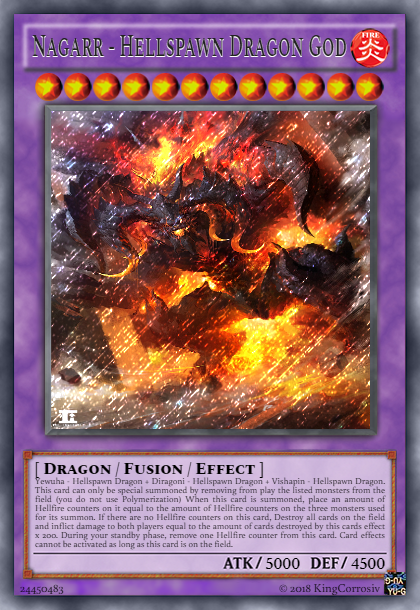 monsters that have altered their attack are not able to attack Diragoni and are destroyed if they try. Diragoni can only be summoned in attack position. Nigusi is the first step in summoning the hellspawn deity Amilak. 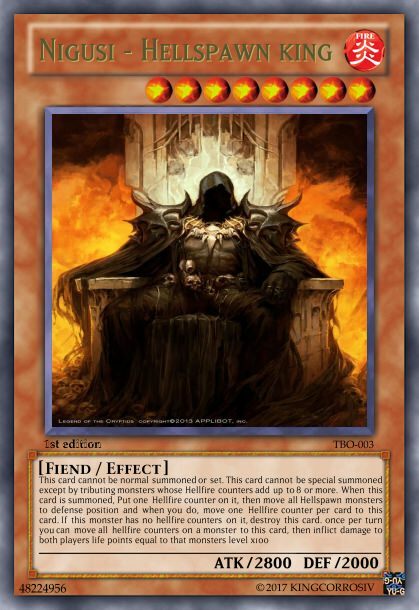 he can only be summoned by sacrificing monsters whose counters total 8 or more. 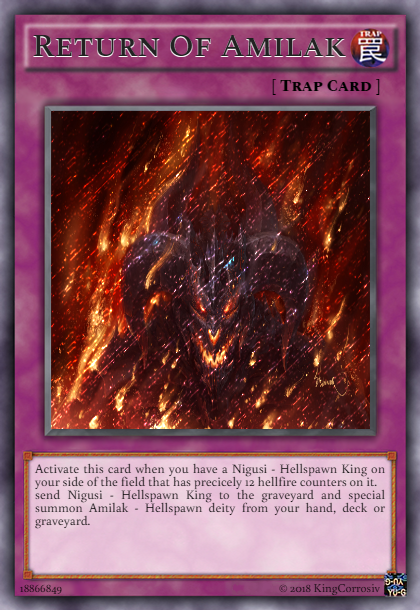 when Nigusi is summoned you can move all Hellspawn monsters to defense mode and move one counter per card to Nigusi. once per turn you may also move all counters on one monster to Nigusi and inflict 100 damage per counter to both players. Geta is the second monster in a series of three boss monsters. Geta can only be special summoned by tributing Nigusi with precisely 10 counters on him. whenever Geta destroys a monster, he gets a counter. 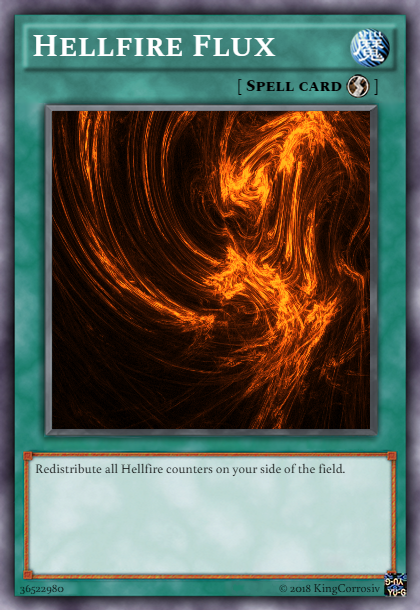 once per duel you may also draw in all hellfire counters on the entire field to Geta. 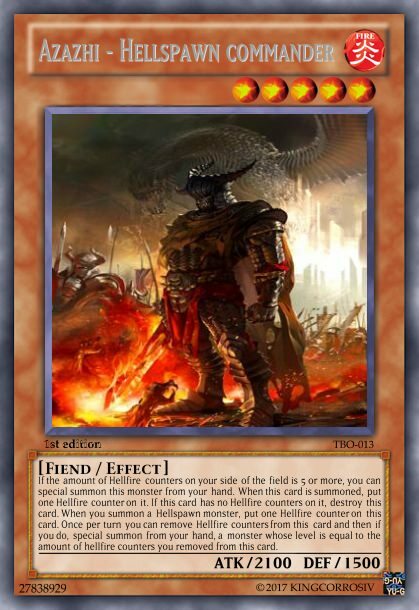 Finnaly once per turn you can remove any number of counters and then destroy that many cards on the field. Amilak is the last stage of the three stage boss monster. Amilak can only be summoned by sacrificing geta with 12 counters or using Return of Amilak. he cannot gain counters except by his own effect. he gets one counter per turn and you automaticly win if there are 5 counters on Amilak. 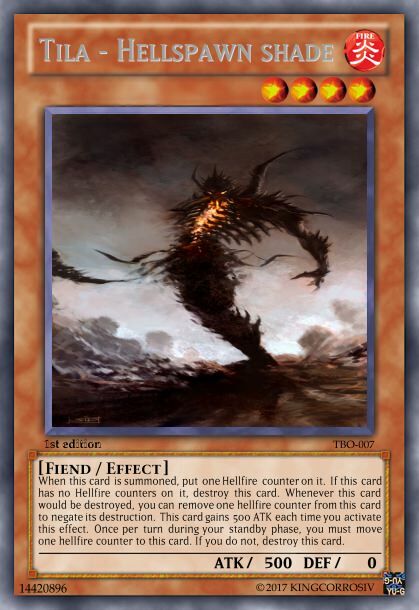 you can also negate and destroy any card that tries to affect Amilak by removing a counter. Nigari is a <1 1> pendulum monster. he cannot be destroyed by battle if he is in attack mode and has counters. 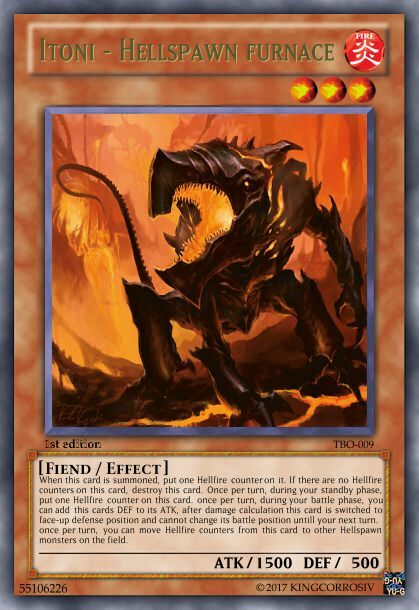 him to destroy a monster on your opponents side of the field. he will gain a counter when one of your monsters is destroyed by battle. 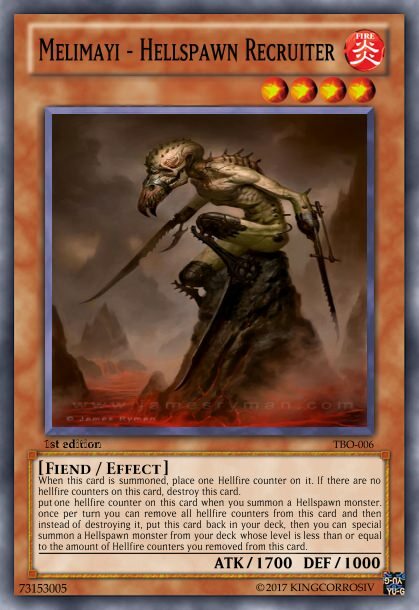 Derawi is a <10 10> pendulum monster who needs to be fed one counter per turn in order to keep him alive. 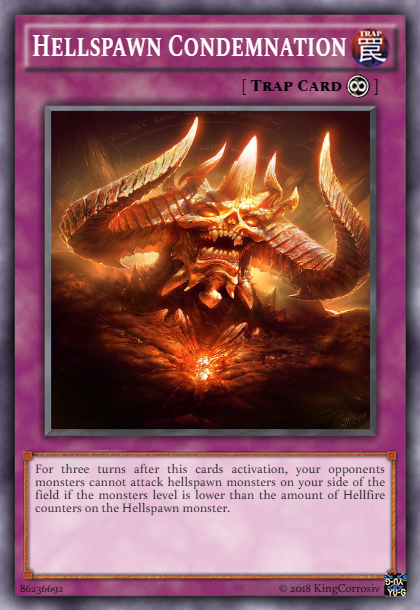 but on the positive side, Derawi allows level 4 or lower Hellspawns to use their effects without using counters. 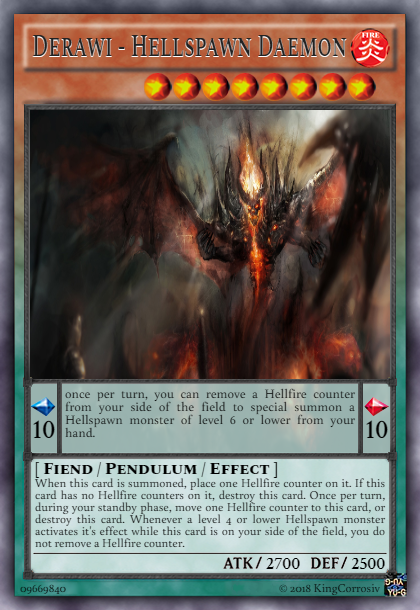 His pendulum effect allows you to once per turn use a counter to summon a level 6 or lower hellspawn from your hand. an equip spell that boosts the attack of a Hellspawn monster by 200 per counter. the monster will also gain piercing damage. 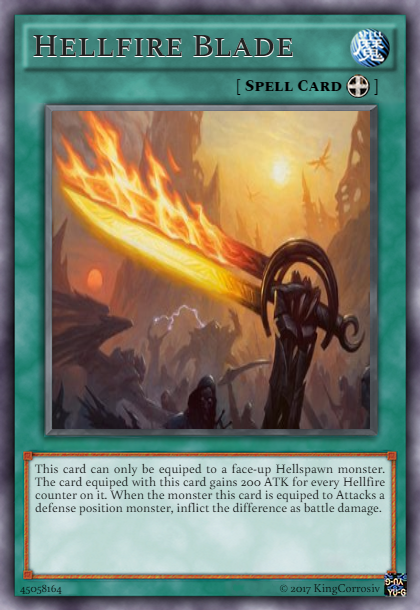 An equip spell that works similar to the Hellfire blade but for defence. also if the equiped monster is in attack mode, you can still use the defence stat instead of attack. this spell acts like a monster reborn, but with a counter cost that must equal the monsters level you are trying to resurrect. 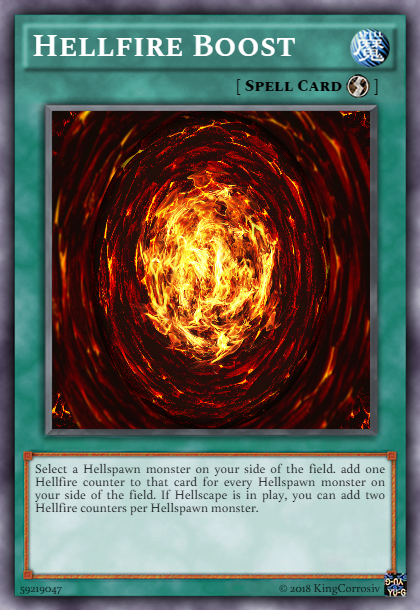 this spell allows you to add one hellfire counter to a Hellspawn for each Hellspawn on the field. 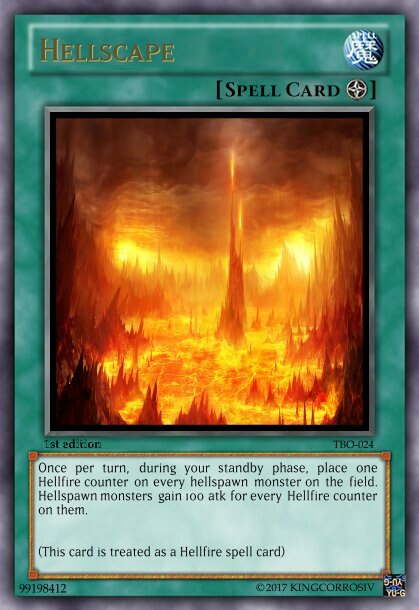 if Hellscape is in play however, you can add two counters instead of one. This spell allows you to remove any number of counters and then destroy one card per counter removed. this card cannot be negated by traps. 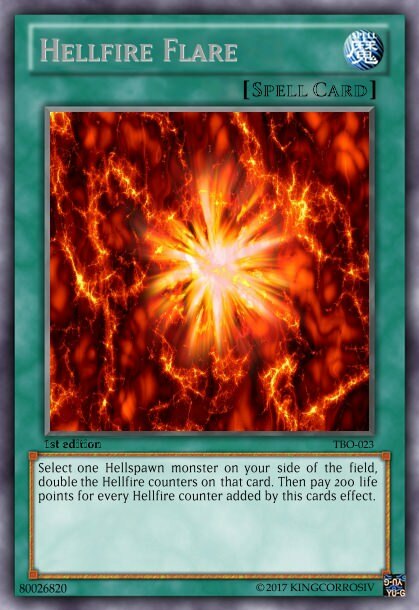 this spell allows you to double the counters on a Hellspawn monster at the cost of 200 lifepoints per counter. 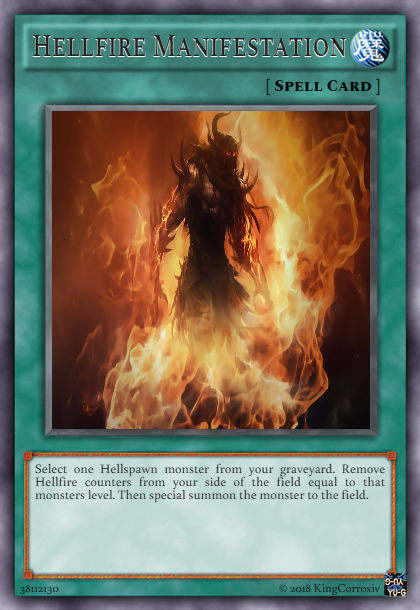 send one Hellspawn to your hand, summon one from your deck or grave. 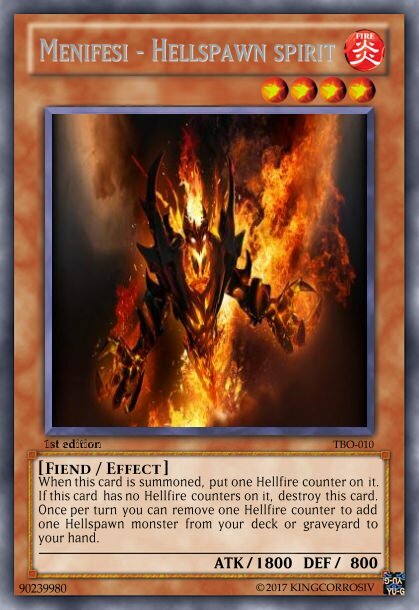 for 500 points per Hellfire counter. 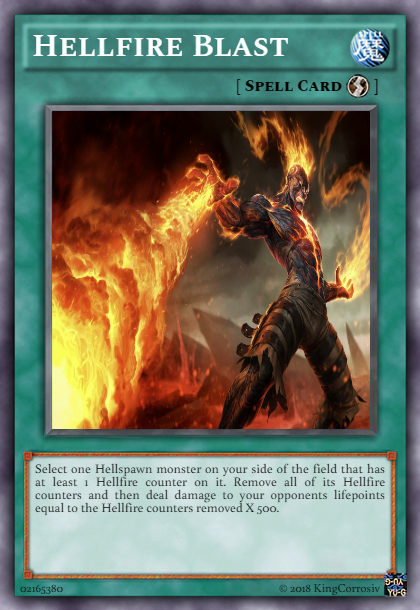 this spell simply allows you to redistribute all of your counters on the field to different Hellspawns. 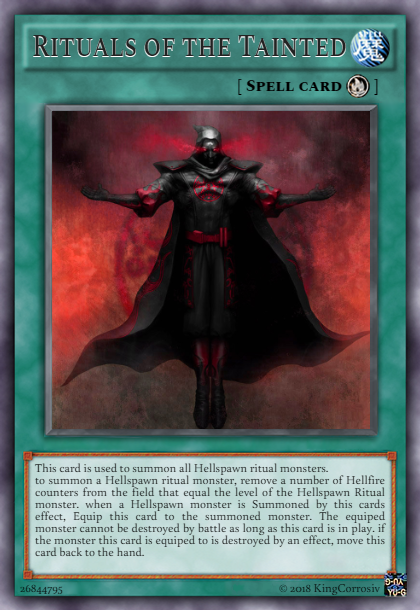 This is the only ritual card for the Hellspawn archetype. it is used for every Hellspawn ritual monster. destroyed by battle. 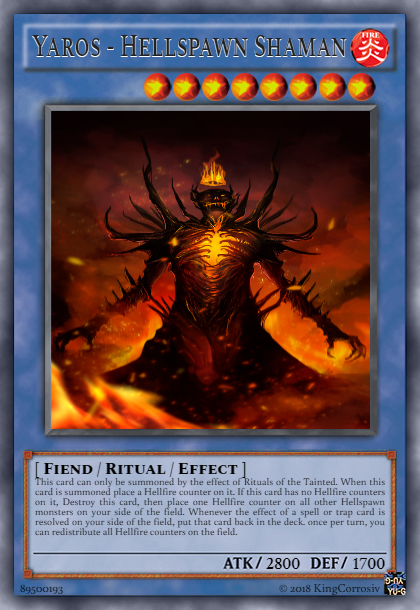 Also when the Ritual monster is destroyed by a effect, Rituals of the Tainted goes back to your hand. 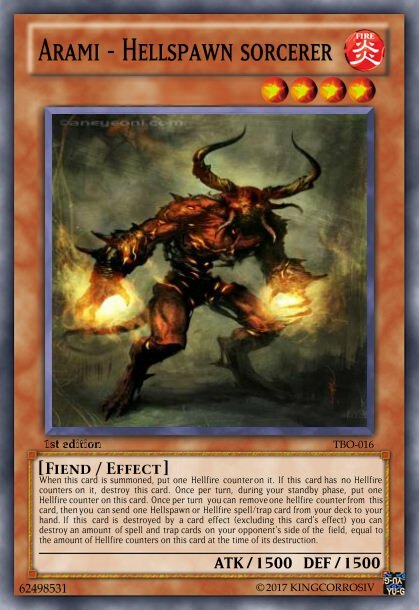 this field spell gives one counter to all of your Hellspawns each turn. 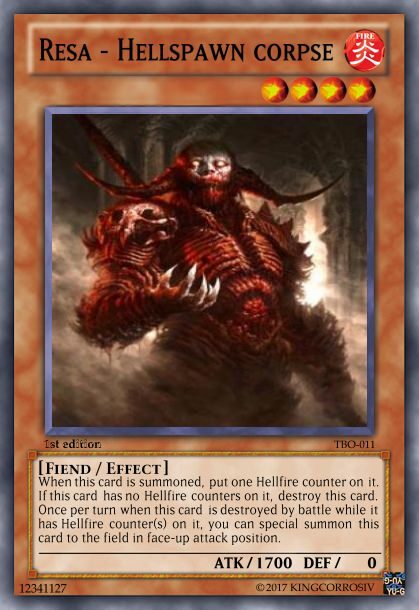 and also gives Hellspawns 100 attack for each counter. but at the end of the turn the monster is destroyed and its counters are placed on other Hellspawn monsters. 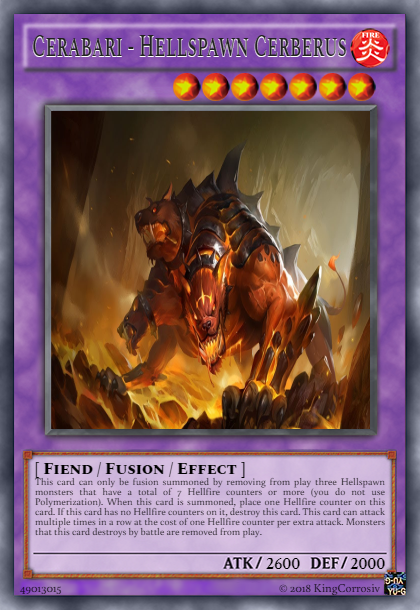 a trap card that returns two Hellhound tokens if one Hellhound token is slain. This trap allows you to negate an attack by sacrificing a monster that is being attacked. 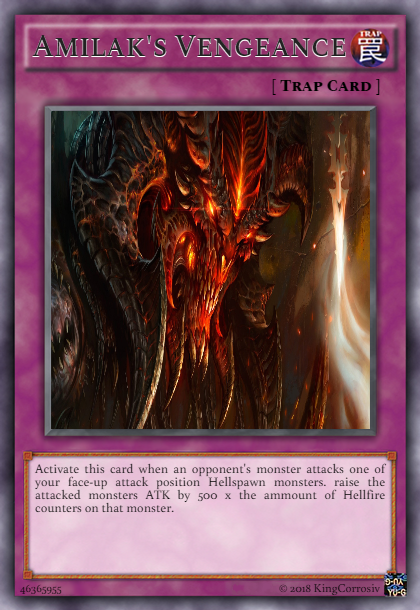 but instead of just destroying the attacker, you can destroy one card per counter on the sacrificed monster. but you have to pay one counter per level of the monster that is attacking. 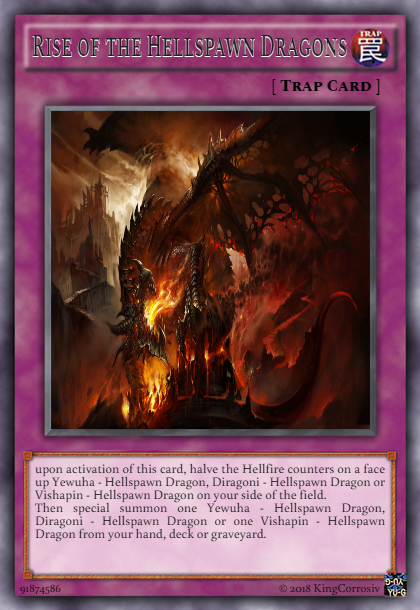 this Trap allows you to halve the counters on a face up Hellspawn dragon so that you can summon another dragon from your hand, deck or GY. this trap allows you to skip a step in the summoning of Amilak by bypassing Geta completely. this trap activates when a monster attacks your face-up attack monster. you can raise the attacked monsters attack by 500 per counter on that monster. This continous trap allows you to once per turn give your opponent the same damage you took in a battle. This trap works for three turns. 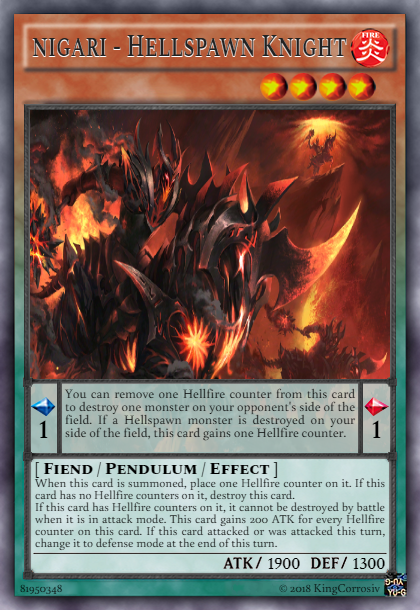 in these three turns Hellspawn monsters that have counters are unnafected by effects. This trap is activated when your opponent uses a spell or trap. 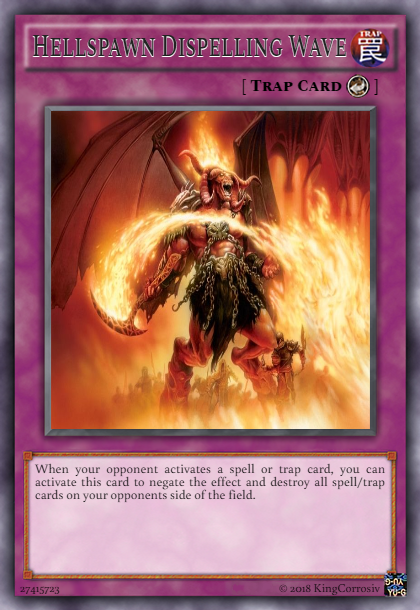 It then negates that card and destroys all spells and traps your opponent controls. 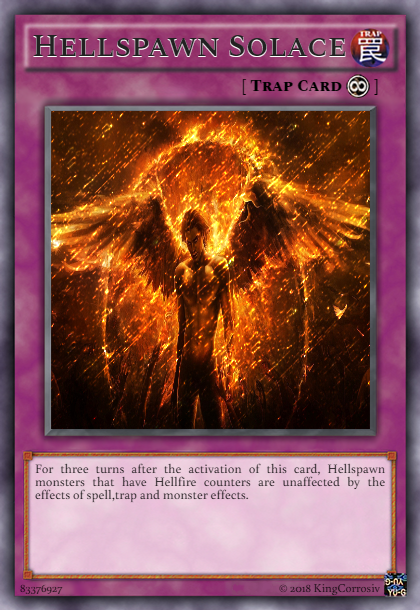 This trap stops your opponents monsters attacking Hellspawn monsters whose ammount of counters is higher than the attacking monsters level. 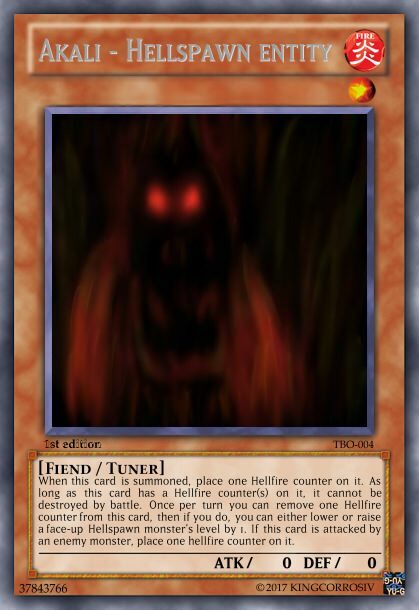 The effect lasts three turns. 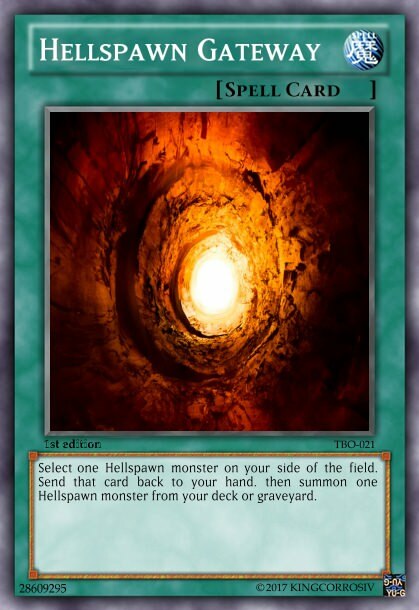 This trap effectively allows you to switch out your current field of Hellspawn monsters for a new one out of the grave. 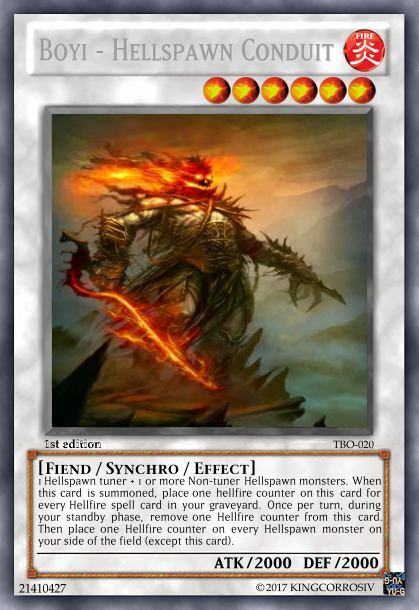 this Synchro gets a counter for each Hellfire spell in your grave. once per turn you can remove one counter from Boyi to place it on another Hellspawn. 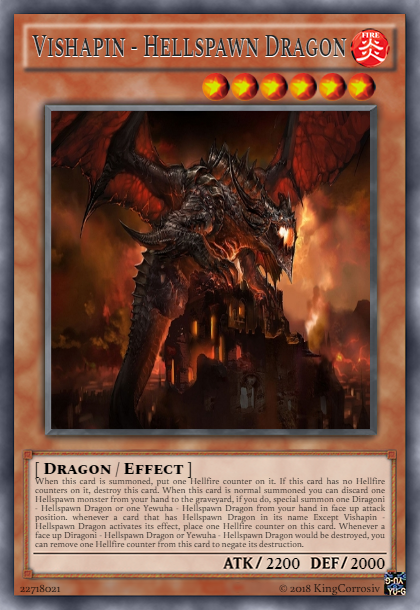 this card is able do distribute Hellfire counters not only to himself, but also to other Hellspawn monsters. He can also inflict extra damage by sacrificing a counter. 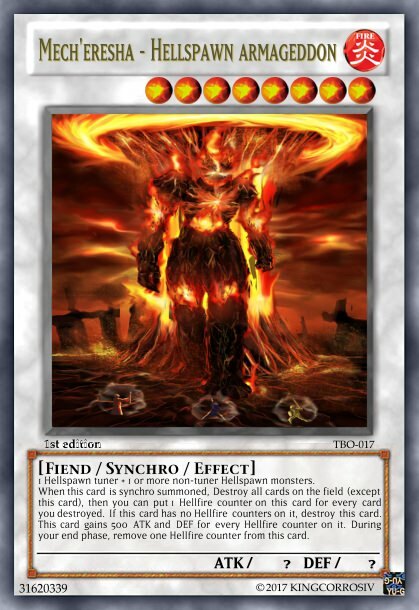 this Synchro monster is a litteral nuke. when summoned Mech'eresha destroys all cards on the field except himself. then Mech'eresha gets one counter per card destroyed and 500 atk per counter. you have to remove one counter per turn however. 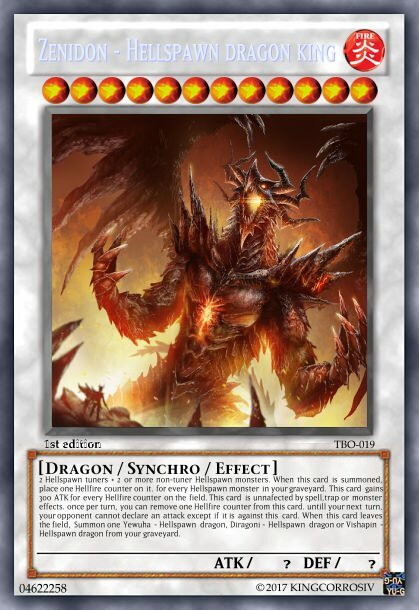 Zenidon is the strongest synchro monster in the archetype. 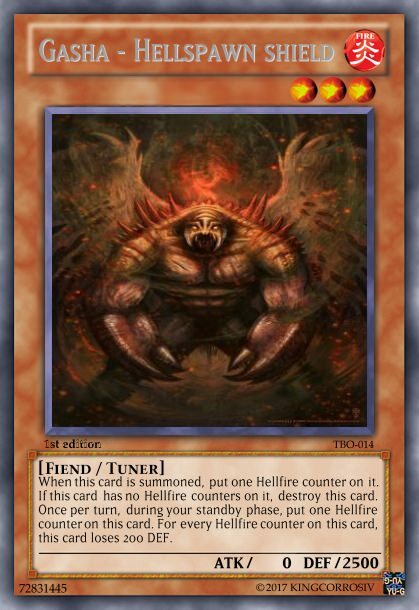 you will need 2 tuners and 2 non tuner Hellspawns to summon him. for every hellspawn monster in the grave he gets a counter. and for every counter on the entire field, Zenidon gains 300 ATK. Zenidon is not affected by any effects and once per turn you can remove a counter to force your opponent to only attack Zenidon until your next turn. finally when Zenidon leaves the field. you may summon one of the three dragons in his place. 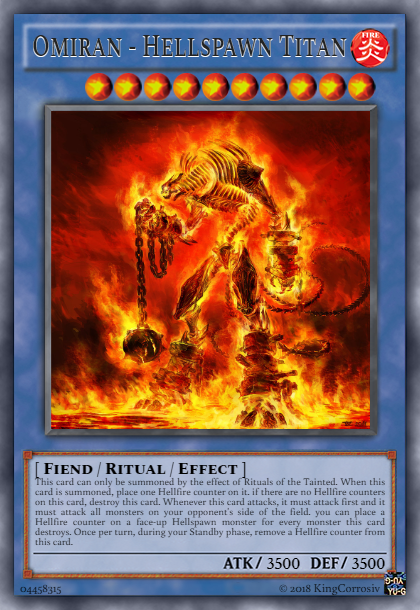 Yaros is a level 8 ritual monster that gives every Hellspawn one counter if he dies because he has none. 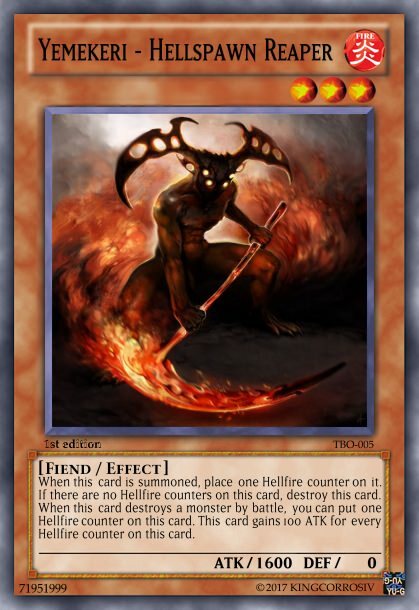 Yaros is on the field, the spell or trap goes back to the deck instead of the graveyard. Omiran is a level 10 ritual monster that MUST attack first and must attack all your opponents monsters when you start your battle phase. because every turn he consumes one of his own counters. Daeros is a level 12 Ritual monster that inflicts half of his ATK as damage to your opponent if he is destroyed for not having a counter. Daeros can hoard counters once per turn and when he attacks you can remove counters to up his ATK by 500 for each counter. After he attacks however he is moved to defence mode. Ravasori is a Link 3 monster that needs 2 or more Hellspawn monsters. Ravasori gets one counter each turn for every Hellspawn monster he points to. 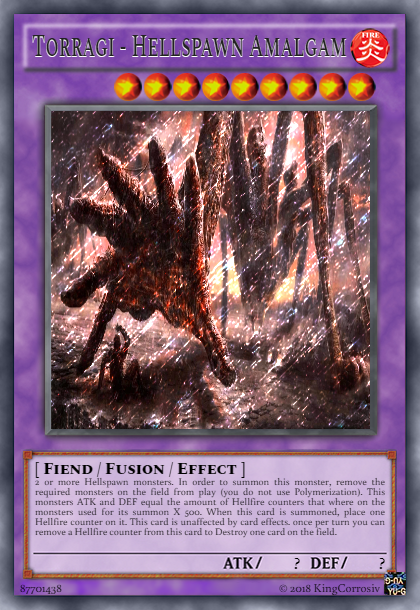 The monsters Ravasori points to also can't be destroyed by card effects. lastly Ravasori can redistribute his counters once per turn. 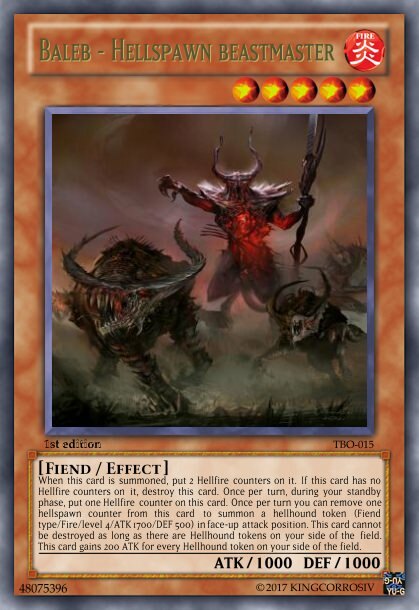 Cerabi is summoned by removing from play three Hellspawn monsters on your side of the field that together must have 7 counters or more. Monsters Cerabi destroys are removed from play instead of being sent to the graveyard. Even though Cerabi cannot generate counters, it is worth giving him counters. This is because he can attack multiple times as long as you pay Counters for those extra attacks. 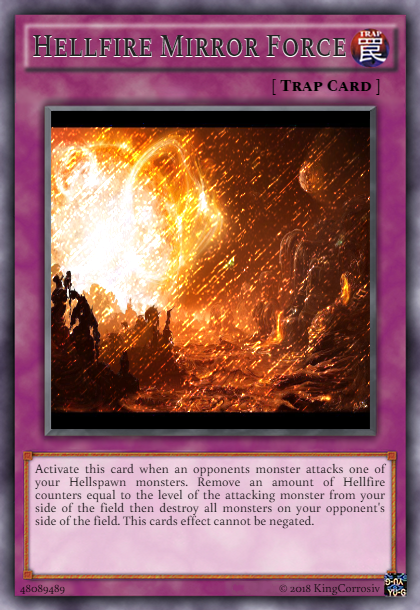 can remove a counter to destroy an opponents card. and if all counters are gone from Nagarr, he won't just destroy himself, but all cards on the field. 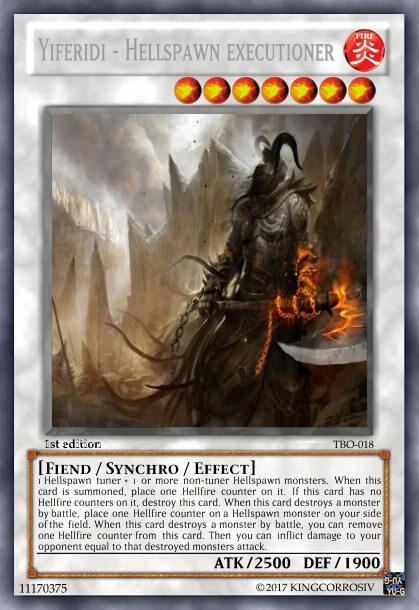 he will then also inflict 200 damage for each card to both players. card effects cannot be activated at all as long as Nagarr is on the field. finally you must remove one counter from Nagarr each turn. Please tell me what you think down below, if you have any ideas for other cards within this archetype, and if you have any tips to make the cards better! 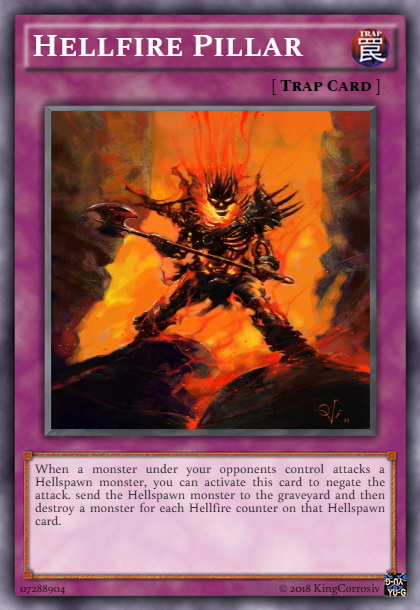 Thank you for checking out the Hellscape archetype!